The alarm went off at 5am and I was out of bed not too long after. While I was getting dressed in the near-dark, quiet house I felt a little nutty. A lot of times when you tell people you're training for this or that the response is, "you're crazy". This is the first time I actually felt they might be right. Getting up to run before dawn in the freezing cold felt a little crazy indeed. But with our schedule today it was my only option. I wore a long-sleeve running shirt with a North Face polartec fleece over that and the matching North Face pants. I also wore gloves and a wide headband that covered my ears. I carried my phone and a gel pack in a Spibelt. I ate a 1/2 bowl of cereal and a few bites of a banana. Just before 6am I was out the door. It wasn't quite as cold I was expecting it to be, which was nice. I did a 4 minute warm-up walk and then started running. 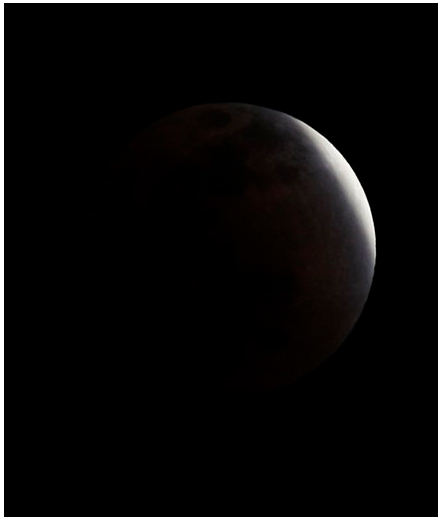 The most amazing thing ever was the lunar eclipse. I'd sort of forgotten about it but then I look up and I see this giant moon in shadow with a glimmer of sunlight still hitting it from the side. Wow. I got to stare at that moon a lot during the first half of my run and I couldn't believe my good luck. There were hardly any cars out at that hour. I ran some on the sidewalk but mostly in the bike lane because the up/down of driveways is irritating. And I've read the asphalt gives a fraction and the concrete doesn't give at all. I questioned my ability along the way. Longest run prior to this was 4 miles so I was really upping things with 7. But my body just kept going and I felt ok. At about the 3 mile mark started to lighten a bit, which was nice. By the time I got to the turn around point it was full on dawn - and I was very happy to start running toward my home instead of away from it. I looked at my watch and had been running for 47 minutes. Eek, that seems *really* slow for 3.5 miles. I vowed to pick up the pace on the return trip. I managed to open, eat and dispose of my AccelGel all without stopping. I really wanted a bit of water but I didn't want to take the extra few minutes to run into the gas station to get it so I did without. I guess I'll be needing to figure out the water issue as the runs get longer. On the way home my hips were aching a little bit. My calves continued with the tight, pre-cramp feeling but nothing ever came of that, thank goodness. Would compression pants help? I had a lot of thoughts about running longer than 7 miles...how will I do it? But as I got closer and closer to home I felt better and better. I'll just do it one week at a time. 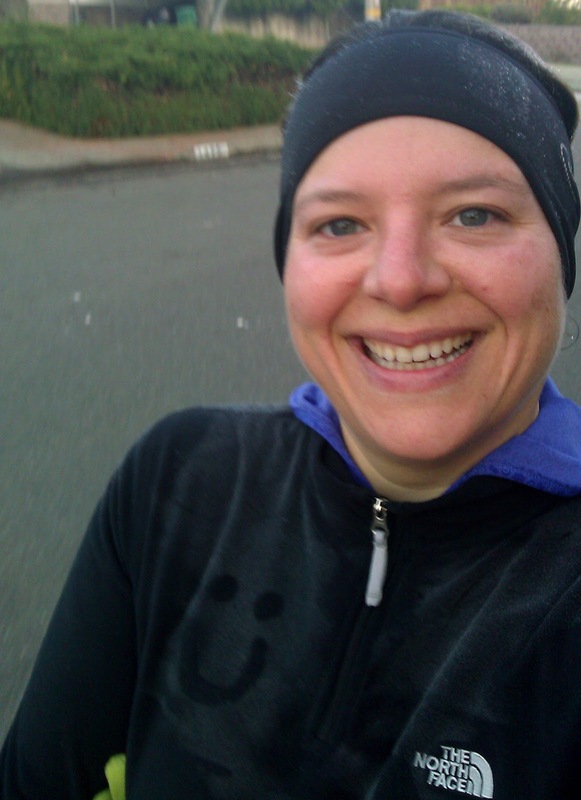 It got *really* cold during the last 1/2 mile and I looked down and noticed a fine mist had formed on my clothes. When I got to the stopping point I took a big breath of relief and quietly congratulated myself for making it happen. I looked at my watch, 1 hour and 34 minutes. I was hoping for an even hour and a half but this was close enough and I was happy. I etched a smiley face in my fleece and snapped a picture to mark the occasion. Whew! Hopefully that will be my last pre-dawn run but if not, at least I know it won't kill me. Next Saturday is 8 miles. I got home and did some stretching and then got ready to go with the family to my mother's club holiday party. It's not even 8am yet! The party was fun, the kids had a blast and I told everyone within earshot that I ran 7 miles this morning. After the party we were all pooped and headed home for naps. I'm going to try and take a nap of my own as soon as I finish writing this. Miguel is gone to a soccer-watching party and won't be back until the kids' bedtime. And then I'm headed to a friend's house to babysit (while her kid sleeps) so they can have a date night (I participate in a date night swap thing - so cool). Where's my vitamin B? Something tells me I'm going to need it! Sweet! If I were there I would high five you! Awesome, so wish I had known you were running at that hour - I may have gotten out to run "with' you a few thousand miles north to watch the eclipse too, doh! Go easy on yourself though - this was the longest run you'd ever done...and you want to stay healthy to see your goal through (personally I think mixing running and walking is a great way to keep your joints and muscles healthy/long-lasting)...I find compression pants definitely help recovery, have never work them during a workout. Congratulations on your 7miles, that is fantastic! people call me crazy all.the.time as i get up at 5am to go out and do a morning bootcamp...as hard as it some days, i love the feeling of being done and being able to get on with my day!